– The music. I really like Daft Punk ever since since my friend and former roommate Katie introduced me to them in college. The soundtrack is spot-on and just damn good. Daft Punk even makes an appearance, so that was fun. – The costume design. Now, I’m not going to be really studying costume design here on SGFS until the summer, but I HAD to note the beauty in Tron’s costume design. 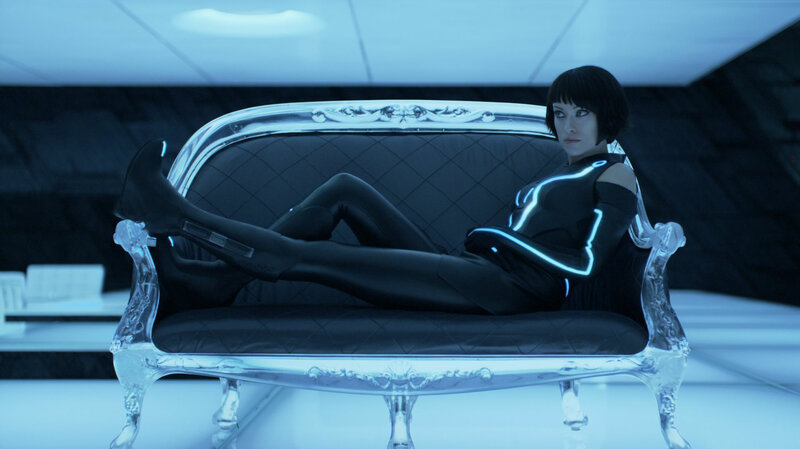 I came across an interview with Tron’s costume designer. First of all, Michael Wilkinson and Christine Clark, the film’s costume designers, had a lot to look up to. The first film led to Oscar nods for costuming (and sound, which are both probably warranted this year, as well). Clark told the LA Times they used nothing organic, even for Jeff Bridge’s character who was all Mr. Zen-ish. Everything was made of some sort of synthetic fiber a la leisure suit. I was insane about the shoes. All of them. And I’m not a necessarily a shoe freak. I mean I can admire a great pair of shoes, but I wear sneakers about 90% of the time. But the boots on Olivia Wilde mirror boots that I had a dream about in 2005, and can’t find them anywhere. But since Disney (the studio behind the original and he sequel) is looking to launch a fashion/accessory line based on the film, my dream may come somewhat true. The original dream included almost the exact same boots she’s wearing (shown above), but in brown suede, and without the fancy light-em-ups. If those go to market, I’m getting them, and no one is going to stop me. Other than that, the story was a little too weak (eh, it’s a Disney movie), and predictable (again, it’s a Disney movie). Jeff Bridges-but-younger didn’t look too bad, except around the mouth, which looked a little sluggish and ghosty. That’s when you know he’s got a CGI face. The “climax” was more like a loud whimper, and the resolution could have happened like 15-20 minutes earlier than it should have. Still, highly enjoyable, visually stunning, and incredibly fun.